Nidal Malik Hasan is an American convicted of fatally shooting 13 people and injuring more than 30 others in the Fort Hood mass shooting on November 5, 2009. Hasan was a United States Army Medical Corps psychiatrist who admitted to the shootings at his court-martial in August 2013. A jury panel of 13 officers convicted him of 13 counts of premeditated murder, 32 counts of attempted murder, and unanimously recommended he be dismissed from the service and sentenced to death. Hasan is incarcerated at the United States Disciplinary Barracks at Fort Leavenworth in Kansas awaiting execution while his case is reviewed by appellate courts. Prior to the shooting, Hasan had expressed critical views described by colleagues as "anti-American." An investigation conducted by the Federal Bureau of Investigation (FBI) concluded that his e-mails with the late Imam Anwar al-Awlaki were related to his authorized professional research and that he was not a threat. The FBI, Department of Defense (DoD) and U.S. Senate all conducted investigations after the shootings. The DoD classified the events as "workplace violence", pending prosecution of Hasan in a court-martial. The Senate released a report describing the mass shooting as "the worst terrorist attack on U.S. soil since September 11, 2001." Investigators in the FBI and U.S. Army determined that Hasan acted alone and they have found no evidence of links to terrorist groups. They are satisfied that his communications with Awlaki posed no threat at the time. The decision by the Army not to charge Hasan with terrorism was controversial. 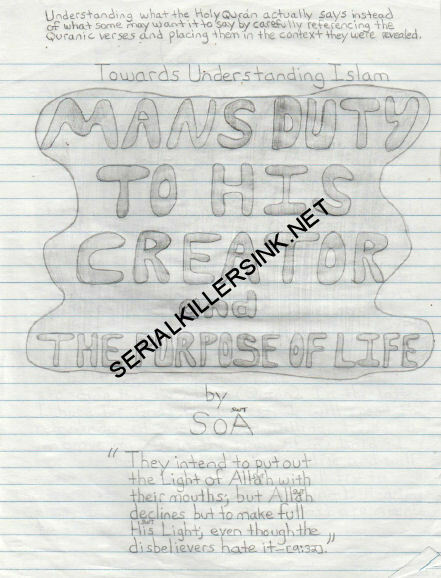 Handwritten manuscript by Nidal Hasan 'Mans Duty To His Creator and The Purpose of Life'. Fifty-one pages in .pdf format. We have provided a preview of the first five pages. This handwritten manuscript has never been seen or read by the public and serves a a direct insight into the mind of Hasan. Watermarks appear on the scans only and not the actual .PDF file. "Although my lawyer(s) will hand this work to the convening authority, I hope it also reaches the hands of all those that were effected [sic] by my actions. My intention is not to offend anyone, but to try to accurately convey to them my understanding of Islam and how I view the world"